Given the success of Syrah across the globe - there are notable examples from warm and cool climates - it is only natural that the producers of Chile would want to work with this variety. 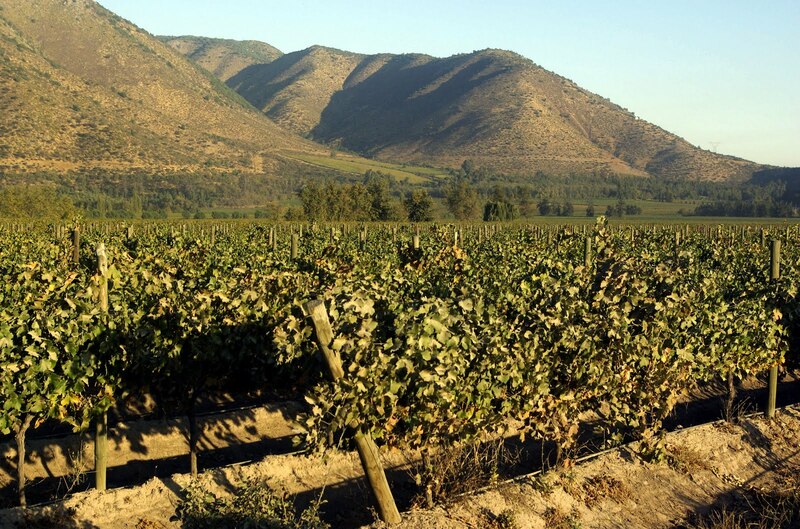 There certainly are plenty of warm areas in the country where the variety thrives, be it modestly priced bottlings from the Central Valley or more full-bodied offerings from an excellent territory such as the Colchagua Valley, some 175 miles south of Santiago. Lately however, some vintners are experimenting with Syrah in cool climates and results are encouraging, though wildly uneven. A cool climate for a variety such as Syrah will often mean a very deep color as well as very good natural acidity. As the tannins are never very strong with Syrah, the wines are approachable upon release, though the structure of these wines argue for at least a few years of aging. To date, my favorite Syrah from Chile has been from Maycas in the Limarí Valley in northern Chile not far from the Pacific Ocean. There are only a handful of producers that are working here and the wines from Maycas, especially the Sauvignon Blanc and Syrah, display excellent varietal character and intensity along with beautiful complexity. These are not simple, fruit-forward wines, but bottlings with ideal structure for aging for 5-7 years and they are priced quite fairly right around $20 or even a few dollars less. So I was intrigued to learn what's been going on with Syrah in Chile lately, especially with versions made from grapes in cool climates. I tasted versions from Limarí, Leyda, Casablanca and Lolol Valleys are the results were a bit disappointing. The best wine I sampled was the 2009 Reserva from Tamaya in Limarí Valley. Though not as rich as the Maycas (the 2008 was the most recent Syrah I've tasted from them), the Tamaya did offer very fine complexity and balance with an appealing note of dark chocolate in the finish. The wine should be at its best in 3-5 years, while the $18 price tag is fair for this style and quality. I also enjoyed the more approachable 2009 Undurraga from Leyda Valley, part of their T.H. series of wines (T.H. for terroir hunter, a clever name!). This is a medium-bodied, round, straightforward Syrah with blackberry, black plum and chocolate flavors, medium tannins and good acidity. It's got a little bit of spice, making it a nice partner for grilled meats and lighter game. It's very elegant and well made, though the $25 price range seems a bit high for the overall quality. There were other Syrahs I tasted recently that just weren't very good; I don't believe in embarrassing producers, so I won't mention them. But overall, I'm just not finding the quality with Syrah in Chile as I have been recently with Pinot Noir (see post). Too many of the wines are overly ripe and have deep purple colors, yielded no doubt from the ever present Chilean sunshine as well as too much time in small oak barrels (one example I had was basically black in color and opaque - you literally couldn't see through it). Do we need all this oak with Syrah from Chile? Do we need jammy, super ripe bottlings of Syrah from Chile? It's as though the producers were chasing points when they crafted these wines. They may be for some people, but they're not for me. I have to think that even the people that like them now may do so for a momentary pleasure, as this style is a bit of a flash in the pan. These wines are not elegant and would overwhelm most food. So what I've learned so far about Syrah in Chile is that Limarí is an ideal zone for this variety as is Leyda (I've also enjoyed a few lovely examples of Syrah from Matetic/EQ in Leyda- the wines offer excellent structure). I have to think there are other areas as well that are capable of notweworthy Syrah. I just haven't tried many, I'm sorry to say. For decades now, vintners in Chile have known the benefit of the warmth of the sun. Theirs is a moderate to warm climate, meaning that conditions are ideal for varieties such as Cabernet Sauvignon, Cabernet Franc, Merlot and their local grape, Carmenere. The country's finest reds have been made from these varieties, from areas such as Maipo Valley (especially the Alto Maipo, a bit southeast of Santiago), Colchagua and Aconcagua Valleys. But there are a few dozen producers that have wanted to scratch an itch for years and that itch is working with cool climate varieties, especially Pinot Noir, Chardonnay, Riesling and Syrah. It all started in the 1980s when Pablo Morandé planted several varieties in Casablanca Valley some 12-15 miles from the Pacific Ocean. He took the chance, it paid off with many lovely wines and today, there are many established wine estates in Casablanca, while many other source fruit from this zone. About a decade ago, a few more intrepid producers ventured even farther west, planting Pinot Noir, Syrah, Sauvignon Blanc, Chardonnay, Riesling and one or two other varieties in the Leyda and San Antonio Valleys. These wine zones are extremely close to the Pacific, with some vineyards as close as 2-5 miles from the ocean. This is a razor's edge climate, so ripening it sometimes difficult, but when it works, it does so brilliantly. To date, I've tasted some lovely Pinot Noirs from San Antonio and Leyda, most notably from Casa Marin as well as Leyda Vineyards. I've also tasted some beautiful examples from Morandé and William Cole in Casablanca. However, I've also had some bottlings from these zones that have been disappoining, ranging from overripe to underipe to harsh and slightly bitter. It's clear that while Chilean Pinot Noir has improved dramatically over the past two decades, much works needs to be done. 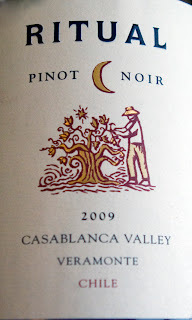 I recently tasted three fine examples of Chilean Pinot Noir that I'll mention in brief. The first was the Valdivieso Reserva 2009 from Casablanca Valley. My notes mention "fresh, attractive aromas of bing cherry along with a note of cardamom spice; medium-bodied, this has good concentration and varietal character, medium-weight tannins, tart acidity and a light touch of wood." 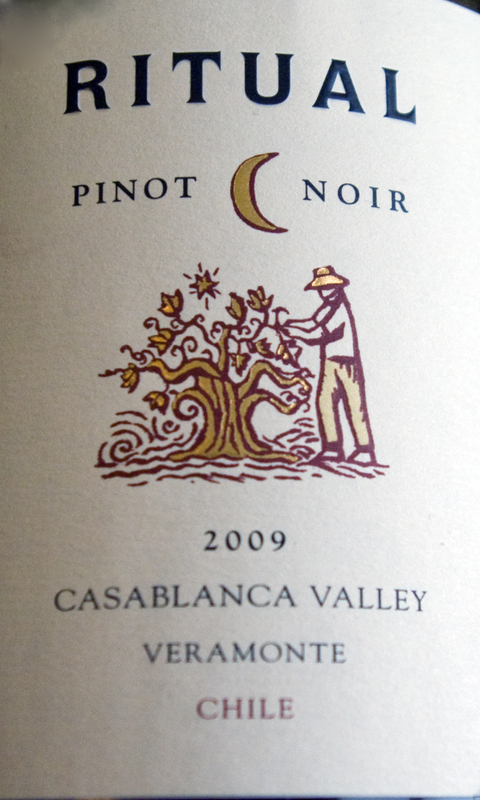 This is an elegant Pinot Noir that is styled for many types of food and is fairly priced at $17. I think most consumers looking for Pinot Noir in this price range would be very happy with this wine. The second wine was the Veramonte "Ritual" 2009 from Casablanca Valley. I've enjoyed this winery's bottlings for many years now, be it the delightful Sauvignon Blanc or the red blend known as Primus. 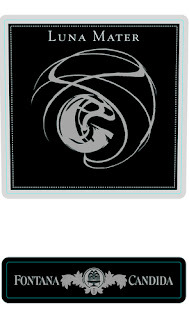 The wines are well made and offer very good to excellent character for their prices. But as good as those wines are, they did not prepare me for the qualities, complexities and character of this new Pinot Noir. Displaying aromas of bing cherry, cardamom and a hint of bacon fat, this wine has delicious varietal fruit with perfect ripeness and a lovely elegance. The finish has good length and is quite flavorful and everything is in balance- the acidity is very good, tannins are round and silky and the wood notes are quite subtle. For $20 retail, this is a steal. I would be happy to pay $30 for this, as here is a wine with beautiful varietal character, lovely texture and impeccable balance. I've tasted $40 and $50 Pinot Noirs from other countries that haven't had this sort of complexity and finesse. Best yet, this is a lovely food wine - I think it would pair especially well with a Thai preparation of chicken or pork. Finally, I sampled the Cono Sur "Ocio" 2008 from Casablanca Valley. This producer has a series of special selection and single vineyard wines that have greatly impressed me in the past (especially the "20 Barrels" Sauvignon Blanc). This Pinot Noir has lovely varietal character, excellent depth of fruit and a velvety feel in the mouth. It is quite rich with beautiful ripeness, very good acidity and excellent persistence. The only problem I have with this wine is the excessive oak; the wine was aged for one year in small oak barrels. Oak in Pinot Noir is a delicate thing and it doesn't take much for a wine to be laden with wood notes. I prefer a different approach to aging a glorious wine such as this in oak, but the winemaker was looking for a particular style. This approach is also taken with numerous vintners of showcase Pinot Noirs in California and Oregon, so this wine is not alone in its balance of fruit and oak. Besides, the wine still has an elegant feel to it; there are no bitter wood tannins present. This is a trophy wine, so to speak, and is a fine example of what Chile can produce with Pinot Noir. Producing notable wines from this grape is a work in progress in many great areas around the world, even in superb zones like Sta. 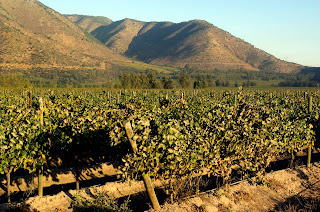 Rita Hills or the Santa Lucia Highlands in California, so Chile is holding its own with the variety. Based on these three wines, the future looks exciting for Pinot Noir in Chile. P.S. A final note- the Cono Sur bottling retails for $65, this price no doubt due to its limited availability. But for me, I'll take three bottles of the Veramonte "Ritual" over one bottle of the Cono Sur bottling every time! A few days ago, I opened a bottle of the 2005 Carmen Winemaker's Reserve Red, if for no other reason than to pair with some comfort food with a friend. I loved the wine when it was released and wanted to see how it was drinking after a couple of years. This full-bodied blend of Cabernet Sauvignon, Carmenere and Petite Syrah is a gorgeous wine, with its striking deep purple color, intense black currant, black plum and cherry and tar aromas and outstanding concentration. This is a wine with beautiful structure and balance backed by firm, but elegant tannins. While the wine is appealing now for its hedonistic pleasures, it's still an infant and has only started to show its greater complexities. Look for this wine to be at its best in another 10-12 years, though it may drink well in another 20 years. I mention this wine not only because I loved it, but because you should realize that for a little while at least, you won't be able to buy this wine in the United States, as it's not being imported. Neither is the winery's brilliant Gold Reserve Cabernet Sauvignon, sourced from 40 plus year-old vineyards at the winery's Alto Jahuel estate in Alto Maipo, a prestigious address for Chilean Cabernet Sauvignon, if there ever was one. The fact that these wines sold for $50-$65 have something to do with it, but let me explain further, as there is promising news from Carmen regarding the availability of their wines in the United States. Carmen has made a change in distribution for the US market and is now going with Trinchero in Napa Valley to represent their wines. The winery believes they will be able to do a much better job than their previous importer (I will not mention their name so as not to embarrass anyone), a company that was much smaller than Trinchero. Carmen worked with this former importer and focused on selling their Classic tier wines ($8.99 retail for such wines as Cabernet Sauvignon, Chardonnay, Sauvignon Blanc, et al) as well as their Reserva wines ($14.99 to $16.99, depending on the state - wines such as Cabernet Sauvignon, Sauvignon Blanc and Carmenere/Cabernet Sauvignon). Because of this focus, the Winemaker's Reserve Red and Gold Reserve Cabernet Sauvignon became much less of a focus, as they tried to work with their importer to boost sales on the other wines. Ultimately the winery decided to make the change of importers and with it, a restyling of wines as well. The new offerings, arriving in the US within a few weeks, will be the Gran Riserva wines, focusing on the best terroirs in Chile; thus we will see Cabernet Sauvignon from Alto Maipo, Sauvignon Blanc from Leyda Valley, Chardonnay from Casablanca, Carmenere from Apalta as well as a few other wines. The pricing will be a very reasonable $14.99 per bottle. I haven't tasted these new wines yet, but given the track record that Carmen has built up over the years, I am excited to sample them when they arrive. I was a big fan of the Reserve wines, especially the Cabernet Sauvignon and Merlot, as the wines offered beautiful varietal character, excellent structure and ideal balance. Best, they were appealing wines with food and offered the character you would normally find in wines that were in the $20-28 range, instead of the mid-teens. So given my pleasant experiences with Carmen's mid-tier wines in the past, I'm quite confident the winery will be delivering some beautiful wines for $15 with these new Gran Riserva offerings. I've also learned that after a short time if things go well with these new wines, the Winemaker's Reserve Red may be brought back for the American market. I sure hope that's true, as I love the wine, but more importantly, that was the last bottle I drank the other day - I need more in my cellar! Frascati has always been known as the "white wine of Rome"; this because it is historically the most famous wine of the Lazio region where Rome is located. While both Rome and the wine have this historical parallel, the wine for the most part just doesn't have the excitement, charisma or complexities of this famous city. In fact, most bottlings of Frascati I've tasted over the years (admittedly very few) have been rather boring. The wine is most often a blend of several white varieties, such as Malvasia and Trebbiano, and is usually aged only for a few months in steel tanks (not wood), resulting in a light to medium-bodied wine best enjoyed in its youth (1-2 years after the vintage date, maximum). Pleasant sipping stuff, perhaps, but hardly a wine anyone would rave about. So imagine my delight when I tasted the 2009 Frascati Superiore "Luna Mater" (mother moon) from Fontana Candida, for here is that rare bird, a Frascati with weight on the palate and excellent complexity. This was a pleasant surprise for me, to say the least, especially as Fontana Candida is known for the typical straightforward style of Frascati. The reason why this wine is so different is the fact that there were two harvests - one at the normal time and the second, a late harvest, which yields grapes that have more tropical fruit flavors instead of the simple apple and citrus perfumes found in an everyday Frascati. My notes list aromas of banana, spiced pear, applesauce and cinnamon - very nice! This is a blend of several varieties, including Malvasia di Candia, Malvasia Puntinata, Trebbiano, Greco and Bombino. The light golden color is the first indicator that you are not dealing with a typical Frascati and that continues with its unique aromas, excellent concentration and a note of almond in the lengthy finish. This is appealing on its own, but is much better partnered with rich seafood such as swordfish or lobster. 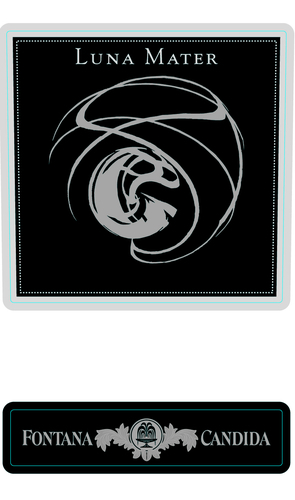 The "Luna Mater" Frascati is imported by Banfi Imports and has a suggested retail price of $23 (very reasonable).